See how myosin moves actin, which is what makes each sarcomere contract. And here's another about what's going on inside of myosin. 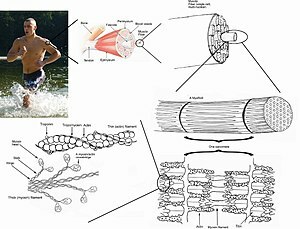 What mechanisms and structures play a role in muscular problems? There's the muscle sheaths that have stiffened by the lack of use of the full range of motion and the constant deposition of collagen, which literally glues the sheath to itself. This tight sheath can impair blood flow to a muscle, especially when the muscle is contracted for a long time. The contracting muscle presses out against a tight sheath. Blood takes the path of least resistance. That lack of healthy blood flow can cause the sarcomeres, the contractile unit of muscle, to get stuck in their contracted position. This is how a muscle gets tight and actually shorter. When a muscle gets very stiff, a trigger point can develop. A trigger point is just an area where many sarcomeres are tight. We certainly notice trigger points, but the muscle gradually hardens for a while before a trigger point develops. The hard muscles are shorter and thicker and this makes manipulating the sheath to break up the collagen much harder. But if the muscle is softened first, it can be done. Massage is how you soften the muscle and get the sarcomeres in it functioning again. Massage pushes depleted blood out and then new blood is pulled in from the capillaries. But there's still one other factor and that is the way muscles communicate with each other to accomplish work. When one muscle is engaged, other muscles receive nerve signals to help. And if there is a trigger point in one muscle, other muscles are engaged via the nerves. When trying to sit for a long time, tight muscles may be pulling you in one direction, requiring other muscles to have to work constantly to keep you upright. This is why maintaining a natural posture can be difficult. It ought to be something you don't have to struggle to do. So you may have a tense muscles but it may be another muscle that is the root cause. All of the muscles need to considered and massaged in a systematic way. Even a seemingly impossible problem may have a solution. Does the sheer size of this list indicate that there still are some critical things missing to our understanding of massage and its effects? I think so. And I think we need better quality data and better theories to isolate the truly valuable things that are common to all of these traditions, as well those things that give each their unique power (if indeed they have any at all). What if we could compare we could somehow measure the effects of each of these therapies? We could identify which works best and save a lot of time and effort. And get a bit closer to understand the underlying characteristics of the body that make massage so valuable. Check out this illustration of the hand. Note the common sheath for the tendons, especially how it runs down the carpal tunnel. Its the big fat structure in light blue. As we've seen throughout the body, sheaths have been known to stiffen when they are not stretched regularly. Could this sheath become stiff enough to cause the pressure on the nerve that characterizes carpal tunnel syndrome? If so, manipulating this sheath may release the pressure on the carpal nerve. Its also conceivable that stiffness in the forearm could be interfering with the normal positioning of this nerve. So, the wrist is flexed, the range of motion available to this nerve is reduced, resulting in the pain. A complex problem with many factors. One thing is for sure. Slicing the ligament is not the last word in treating this painful condition. 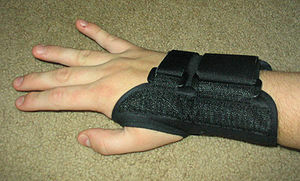 Are Wrist Braces for Carpal Tunnel Syndrome a Good Idea? Some thoughts on the topic. Personally, I believe immobility helps in the short run but costs you big in the long run. Loss of range of motion is the circulatory problems at the root of carpal tunnel syndrome. Immobilization can only exacerbate the problem. It is not a real solution. You are much better off practicing Qi Gong or Tai Chi. Get the blood moving into the muscles involved and get the muscles to relax. Then do gentle stretching and massage.